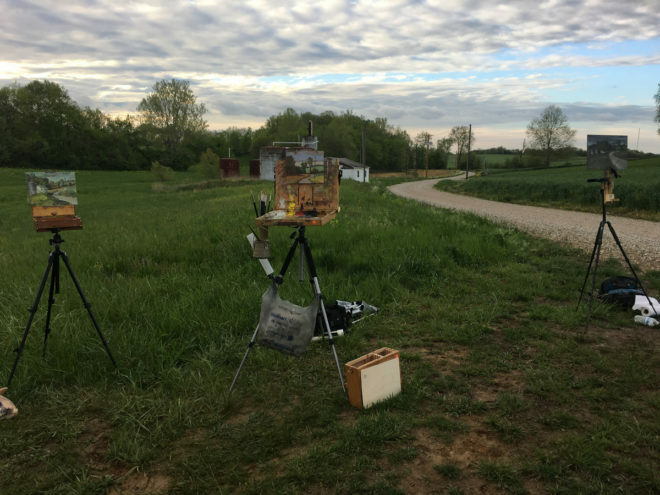 The Indiana Plein Air Painters Association First Brush of Spring event is a 4 day event in New Harmony, Indiana where artists from all over the midwest come into town and spend 4 days painting scenes from around the area. Friend and awesome artist, Jed Dorsey, & I got into town right around the same time. We checked into the Hoosier Salon, got our canvases & panels stamped for the competition and got right to work. My first painting of the trip. It was right before sunset and the light changed so fast that I had a hard time keeping up. Jed's painting turned out awesome. 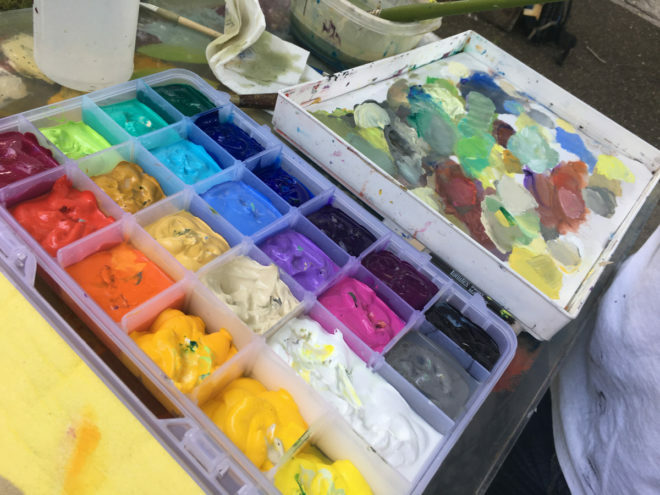 Jed works in acrylic and has found a creative solution to keeping his paints from drying up. 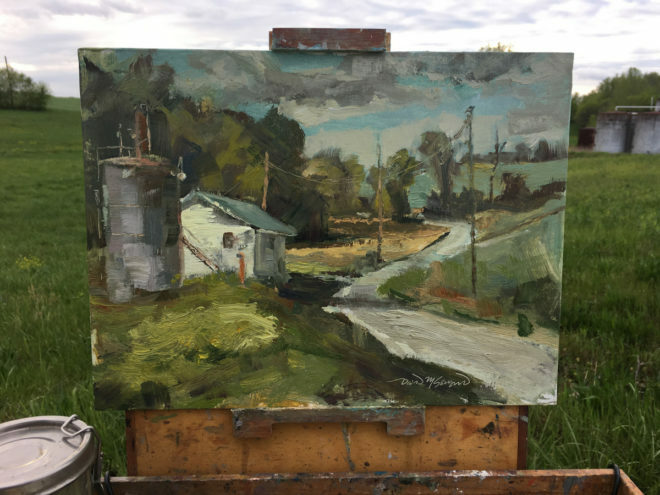 Jed and I had dinner at the Yellow Tavern in New Harmony and were on our way out when we overheard that Wyatt Legrand and Larry Rudolech were headed out to paint so we joined. My first painting of the night, the values seemed to be in check with this painting but when I took it out of my wet panel box the next day it was super green. At night you have to mix the colors you see mostly by instinct while focusing more on value. When I saw it in sunlight the next morning it was a very surprising result. 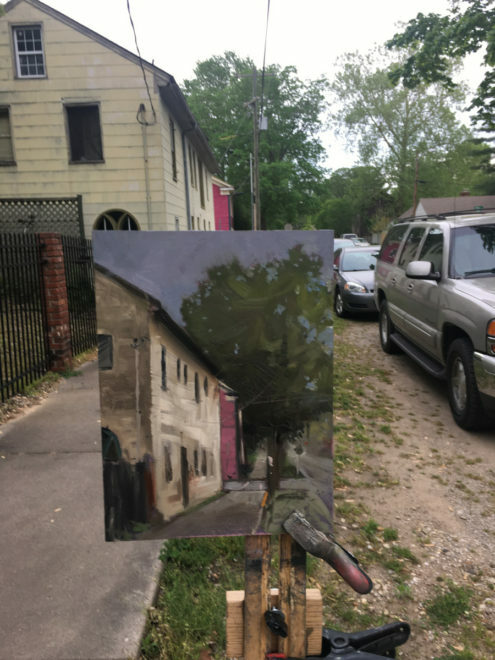 Day 2, My first painting of the day was in an alley and I found this cozy little scene. About halfway through this painting, I was delivered homemade cookies & lunch from some passerby's on a golf cart. For my second painting of the day I stumbled upon the legend, Ron Mack. 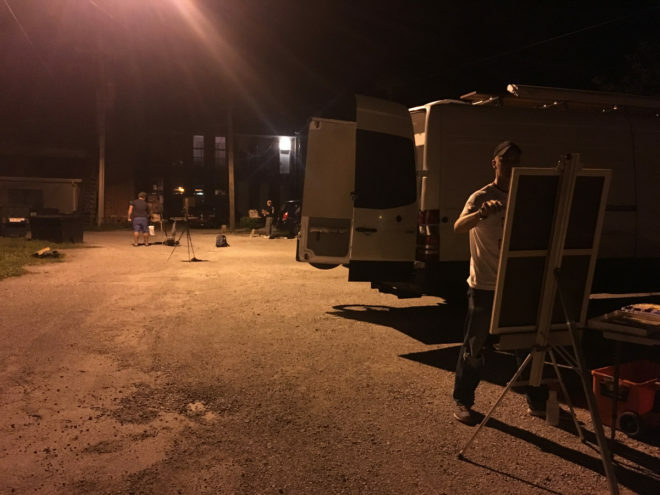 We painted next to each other for a few hours and both sold our paintings right off our easels. At the end of the second day there was a 1 hour quick draw event where everyone who enters has an hour to make a painting and this was my effort. I always think its cool to see the super fresh paintings lined up in a row on all the different easels for judging. 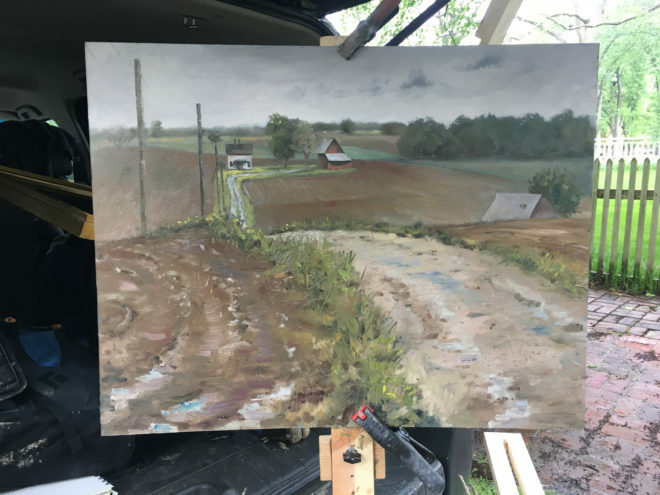 Day 3, it was raining in the morning and I joined up with Jed, Charlene Brown, Jessica Green, & Stephanie Thompson under a tent for a quick painting and then headed out to the country. It rained all day so I set up my large pop up tent so I could at least stay somewhat dry and comfortable. 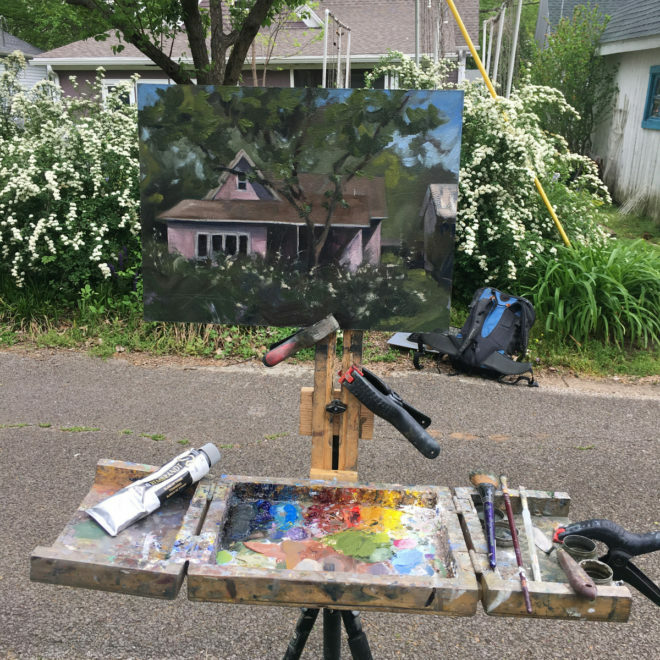 As soon as I drove over this hill and came across this scene I knew it was what I wanted to paint. Everyone setting up their competition entry's to be judged. 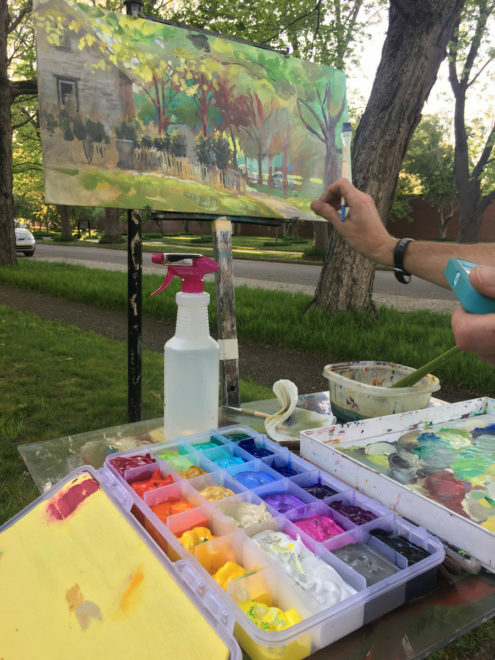 After the awards were handed out I overheard David Seward say that him and Mark Vander Vinne were headed back out to paint. So I invited myself along, and joined them for one more painting before I headed back to Indy. I thought it was really cool to see how we all painted the same scene and interpreted it differently. I found the wisdom on David's palette cover super interesting & relevant.